With a new massive illegal immigrant caravan arriving at the US Border today, ALIPAC is warning President Trump that by allowing most of the caravan illegal aliens to enter the USA to roam freely while deploying his lifelong Democrat son-in-law Jared Kushner to craft an Amnesty deal for millions of illegal immigrants with Congress, he is attracting more illegal immigrants and decreasing his chances of reelection in 2020. Jared Kushner is unfit for any significant policy or legislative efforts because of his revoked security clearance over foreign influences, allegiance to Democrats, EB-5 immigrant investor visa program scandal, and unpaid fines for unsafe and unsanitary real estate holdings. "Each caravan of illegals Trump lets in and each effort to get Congress to pass Amnesty protections for DACA and Dreamer illegal aliens decreases the number of base voters Trump can rally to his aid in 2020 while encouraging more illegals to enter and remain in the US unlawfully," declared William Gheen, President of ALIPAC. "Much of Trump's base feels betrayed by his focus on Amnesty and his appointment of Democrat Jared Kushner to spearhead Amnesty deals with Congress. Each Congressional vote on Trump-backed Amnesty bills decreases Trump's chances in 2020, and if any form of Amnesty should pass, Trump becomes permanently unelectable as do all Republican Presidential candidates in future US elections dominated by Hispanic Democrat socialists." Eighteen illegal immigrants were recently fired from Trump's golf courses only after his administration was embarrassed by national news coverage of their employment casting doubts on Trump's dedication to the very immigration issues he campaigned on. Jared Kushner is a lifelong Democrat with many left-wing views contrary to the MAGA promises of Trump's campaign. His offices are located at 666 5th Avenue, New York, NY and Kushner's security clearance in the White House was originally rejected because of concerns over his allegiance to foreign influences. Kushner is involved in visa scandals regarding the EB-5 immigrant investor visa program, also known as the "golden visa," and was part of the controversial sales pitch made by Kushner's family to Chinese business people, who were asked to invest $500,000 in the Kushner real estate empire in exchange for preferential immigration treatment. Jared Kushner's real estate company is also scandal-plagued with an issue of over half a million dollars of unpaid fines for various New York City sanitation and building violations! 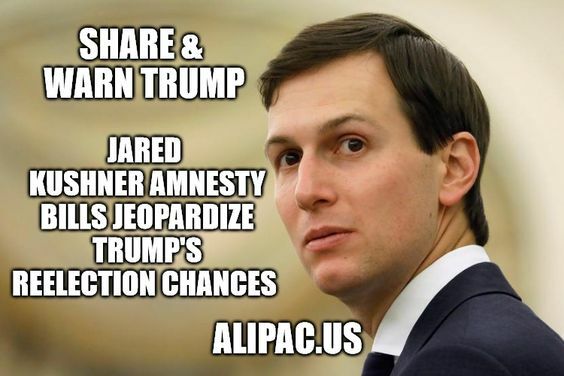 -- January 24, many Trump supporters were shocked when McClatchy News reported that Jared Kushner had met with pro-Amnesty Hispanic groups such as LULAC (League of United Latin American Citizens), Libre Initiative (Koch Brothers Group), and the Hispanic Chamber of Commerce to offer Amnesty for 1.8 million illegal aliens in exchange for some border structure funds. -- January 24, Breitbart News reported that Jared Kushner was advising Trump against declaring an emergency to build border defenses because Democrats are coming along soon on legislative Amnesty deals. -- January 26, National Review reported that Jared Kushner was working with Democrats and the pro-Amnesty Republican wing led by the Koch Brothers to pursue relief from America's existing deportation laws and a path to citizenship for DACA and Dreamer illegals. The article reports the Koch Brothers are pumping money into the campaigns of Republicans Governors Ron DeSantis of Florida, Doug Ducey of Arizona, Kim Reynolds of Iowa, Mike DeWine of Ohio and Greg Abbott of Texas, as well as senators Rick Scott of Florida, Mike Braun of Indiana, Josh Hawley of Missouri, Kevin Cramer of North Dakota and Ted Cruz of Texas. This may explain Senator Rick Scott's Feb 1 flip flop on DACA Amnesty which he now supports! 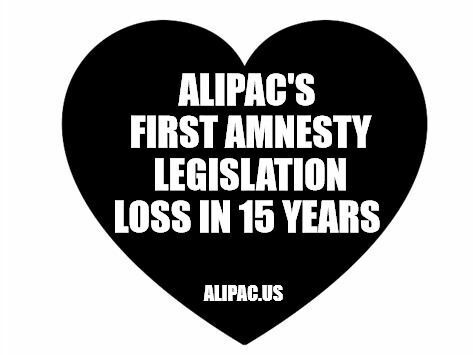 ALIPAC is encouraging all Trump supporters, illegal immigration, and Amnesty opponents, Republicans, and non-socialists to organize and push back against the Trump/Kushner Amnesty plan designed to please Democrats and illegal aliens. Last edited by ALIPAC; 02-05-2019 at 01:56 PM. Last edited by ALIPAC; 02-05-2019 at 02:08 PM.